Pulled the trigger on a new AT4 today. Now I need a tonneau cover. What soft roll up tonneau cover works best with the new multi-pro tailgate and grab handle? Pulled the trigger on a new satin steel AT4 this morning. MSRP was $64,995 price paid $55032 less trade for my 2016 Sierra 4x4 AT $36,712. I walked out paying $18,500. Pics will be coming next week. What dealer and where are they located are you working with? How loud is the performance exhaust in the backseat when you are pulling a trailer and the engine is running between 2600-2800 rpm? I am leaning towards ordering a truck with all the options I want! I have done that with the past four trucks I have purchased and I have been so much happier with them. I highly doubt anyone would qualify for all rebates. Why were your injectors replaced? It is hard for me not to look at the 2019 Ram for my next truck. Their pricing is amazing but I still question the quality. I am expecting and will hold out for some good incentives from GM in the next few months on the T1 once the limited models are gone. 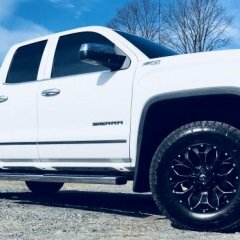 Does anyone know what the April incentives are on GMC Sierra 1500’s? For those of you who have the Duratracs on your AT4 how do you like them? Are they noisy and how do they ride? I am getting ready to order a new AT4 and I am on the fence whether to order the truck with the 18” wheel and Duratracs or go with the 20” wheel and put ridge grapplers on them. Thanks for the help! Nice work fellas! Thanks for answering the question! Directly straight back from the pinion yoke stamped on the casting. Can any T1 non NHT owners confirm that the 9.76” rear end is installed on their truck if equipped with the 6.2L? It is stamped on the rear end by the yoke. My dealer has no idea? 🙄 My 2016 AT 6.2L has the 9.76” but before I pull the trigger on a new AT4 I want to confirm the 6.2L still gets the 9.76” rear end. Thanks! Everyone is giving the Ram interior raving reviews. Sure it looks nice new but again it is a Ram and long term it will turn into a rattle trap. The T1 interior is nicely laid out and functional!